Only a time-tested and proven Executive Résumé Writer/Certified Professional Résumé Writer will help you advance your career or get hired quick with a salary increase. There is a serious shortage of genuine talent in our profession. With vast experience as a Hiring Manager/Recruiter, Copywriter and Certified Professional Résumé Writer you will reap rewards for years from my assistance. Your new Righteous Résumé, Linkedin profile and Cover Letters will pay for themselves many times over because they produce a marvelous return on your investment. Why would you ever take a knife to a gunfight? All résumés include an in-depth personal interview/brainstorming session aka interview practice (rare), expert advice during interview, compelling content that motivates hiring committees, targeted keywords/SEO, important technical instructions, 7 closely guarded trade secrets, secure backup document storage and my free game-changing job search eBook/executive job search eBook. The eBook alone could realistically save you six months of job hunting effort. Payment is always required at the end of the interview. I prefer cash or checks as payment, and will accept all credit cards through PayPal.com if necessary. If you want small monthly payments I have 0% financing for 6 months if you have good-to-excellent credit (let me know in advance for pre-approval on this promotional offer). Free Expert Résumé Reviews and Quotes by Email. Normally 95% need expert help with their résumés. But, I have to see it to know how much of an upgrade/rewrite it needs. I provide an objective reviews, recommend solutions and provide a written quote. Your estimate on investment depends on degree of difficulty, interview, research, writing and editing time. Please allow one business day for review please. These reviews are reserved for those that know they need help. Send your best current résumé and most desired job title goal/job posting to: zane@righteousresumes.com. Expert Coaching, Advice and Consultations for Resume Writing, Linkedin Profile Writing, Job Search Strategy, Career Change, Advancement, Expert Editing, Job Search Solutions: $50.00/hour; Executive Career/Job Search Coaching $75.00/hour. I will provide you with breakthrough strategies, content upgrades and ensure you overcome all your biggest job search or resume writing challenges by phone. My expertise and advice on your specific situation will save you months of wasted effort and accelerate your job search. I offer this service Nationwide by telephone however, I do require that you email your résumé and make an appointment first so I can fit you in. Expert coaching is highly recommended for anyone transitioning from a military to a civilian career, changing careers or targeting dream jobs/most admired employers. Interview Bonanza Cover Letters, Broadcast Cover Letters and Letters of Introduction: Professionals $99. Executives $125. Required to Access the Hidden Job Market by targeting the 67% of job openings that are never advertised. These are designed to be strategic blueprints for more and better interview opportunities for you. They should be used often in your Fortune 500 job search. With these treasure maps to your dream job, you will prosper. You should order at least two letters to accelerate your job search. Many better employers state that submissions without a cover letter will not be reviewed/accepted. One-Page Righteous Résumé: $299.95 This is a significant upgrade over a typical résumé, only for professionals earning < $45K annually. If you have a longer work history, higher earnings or a college degree, technical or specialized field see below. Includes targeting, keywords, research, editing, proofreading, a personal interview, attractive styling and advanced strategy (1 page). Our gift certificates are ideal for new college graduates, entry-level to mid-level professionals! One-page RighteousResumes with Two Columns: $399 These require much more labor and advanced desktop publishing skills. Two-Page Righteous Résumé: $399.95 A significant upgrade over any typical typed work history for those earning less than $45K/year with a longer work history. Includes targeting, keywords, research, editing, proofreading, a personal interview, attractive styling and advanced strategy (2 pages). Executive Righteous Résumé for Directors, Sr. Managers and Executives or ALL THOSE WITH >$80K/YR in earnings or graduate degrees/highly specialized fields: $599.95 For MBAs, MS, PhDs, MDs, IT Managers/Directors etc. Includes 2-3 pages, a prestigious Executive presentation, longer in-depth interview for fact finding/interview preparation, compelling executive-level content, advice, brainstorming and mutual collaboration, research, keywords, SEO, serious strategy. This is the ultimate résumé when you must have the very best because results matter and the competition for higher earnings is always fierce. (Allow 4-5 days for completion). Senior Executive Righteous Résumé: $699.95 Any VP, President or C-Level position regardless of income requires the highest level of expertise, more research, a longer personal interview/interview preparation, strategic planning, advice with plenty of brainstorming. It takes vision, forward-thinking, executive level writing/editing and a big picture view to handle these assignments because we are catering to executive search committees. The entire resume is written to ensure you achieve your #1 goal. Includes keywords, SEO, value building, targeting, a prestigious Executive presentation and high performance writing/editing for the very best in results humanly possible. Please allow 5-7 days for completion after interview (up to 3-4 pages). Linkedin.com Profile Writing, Editing & Publishing Online: $299.95, $399.95 & $499.95 after resume purchase only. Normally 5-8 pages of content when printed. Your in-depth personal interview, my vast experience and research allow me to develop superior content (Yes, all my clients are interviewed). A great Linkedin profile is essential for all professionals that want to earn >$50K/year. It's 2017 people. Distinguish yourself where the most employers are looking for you most and attract multiple job offers. Employers and recruiters use Linkedin.com to find 95% of candidates today and they only pick from the top 5% of all candidates period. Your new Linkedin profile will receive 10 times more views by employers than your resume because LI is the #1 professional networking website, career website and resume database in the USA with 500 million members in 2017. This includes writing, editing, keywords/SEO, proofreading and formatting. Righteous Résumés or CVs for Federal Government, Academic, Scientific, Mathematic or Medical Careers: $60/hour. Written estimates provided free via email, an average client would typically pay $499-$699 although actual price depends on degree of difficulty, career goal, career field and page length. Submit best current resume with ideal job posting and #1 job title goal for a quote. A personal interview and your most desired job posting is required for a successful outcome. Please allow 5-6 days for content development, research and editing. Résumé Modifications and Résumé Updates for Existing Clients: Ask for quote via email and provide me with your #1 most desired job-title goal. I am affordable at $50/hour or $75/hour for executives/high-income earners. Final price depends on degree of difficulty, interview, research, writing and editing time. This involves updating/retargeting your existing Righteous Résumé to achieve a new career goal that is different, but related enough so that at least 67% of the résumé can remain the same, while the rest is rewritten to achieve a different career goal. Smart/talented professionals have 2-3 different versions working for them simultaneously. This allows them to earn many more interview opportunities, so their job hunt is brief and they receive multiple offers. Memorable Thank You Letters: $55 each. Be remembered long after the interview. Get the job even if they were not planning on you as the first choice. Improve results. Enhance your image and show some class. Not executing properly with a thank you letter/card has consequences. Choose from an ultra-classy handwritten style or a typed digital document. Righteous Résumé Gift Certificates: Created in any amount with a personalized message for a gift with lasting and significant benefits. Attention Parents and Grandparents these make an excellent gift for new college graduates, graduate students, those seeking career advancement, career changers, military personnel or the unemployed professional. Résumé, cover letters and Linkedin profiles are the most requested gift certificates. Separate gift certificates allows several family members to pitch in for the only graduation gift that keeps on giving. Written Interview/Written Essay Answers: $149-$199 per page depending on the degree of difficulty. These are commonly a requirement for many jobs where written communication skills are essential and act as an additional screening tool/intelligence test. I will help you progress further with your interviews. Interview Preparation/Expert Advice/Job Search Coaching: $55.00/hour; $75/hour for Executives. A full professional interview with tough questions by phone, with objective evaluation and recommendations for improvement. >>> This is what winners do to earn multiple job offers! <<< Think about this for a full minute: If successful executives regularly do this shouldn't you? There is no substitute for confidence in employment interviews. Miscellaneous Customized Letters: $99. Introductions to Industry Movers and Shakers, Resurrection Letters for Old Colleagues and Friends, Asking Advice to Industry Insider, Nomination Letters, Join My Professional Network Invitations, Resignation and Formal Acceptance Letters, Letter to Clients for Move, Career Change or Employer Change, Follow up after phone call, meeting, or brief visit, I like your offer but I require this salary... All miscellaneous letters include any one-page letter that is not selling a person, service or product. Note: All executive-level letters are $125 each. Rush Orders: Finished in 48 hours $150. Please understand, great customized writing, editing and proofreading is time intensive. Also, well-established and talented CPRWs are normally always booked in advance. Call me ASAP for this service if it is really necessary. Editing and Proofreading: $50 per hour. If extensive corrections are needed ask for a résumé review and quote first as a flat rate rewrite may be best. Proofreading only is $5 per page. Documents on CD: $17 each includes delivery by US mail prevents data loss, requires final approval by you first. Sent from Dallas Texas via first class mail in a protective pouch. Format Choices: MS Word is normal, MS Works, PDF, HTML, and ASCII (ASCII or plain text requires reformatting $35) Please tell me which version of MS Word you use on your home PC. Many employers give instructions to submit documents in Word or PDF only. Sales Letters: $299. per page. Selling services, products or even high value consulting contracts to the Fortune 500, business to business or consumers. My copywriting has earned millions for my clients who use direct mail or the Internet. Learn more at http://WordsThatSell247.com. Here, you are paying for real results not a type-written work history/document! What makes me better is all my insider knowledge and experience as a hiring manager and recruiter, listening to feedback from all my clients, extra research, know how, using keywords specific to your industry, customization, targeting, a proofreader's services, a personal interview, many industry trade secrets and no typing from you. This results in you earning a higher salary. Our mission is to get you hired in 1/3 the normal time while you enjoy more pleasant interviews. Please note: My services cost less than being unemployed just one week. Invest in your own success! To order call 469.540.0455, but first email me your old résumé so I can review it for an estimate, then we will arrange a personal interview. My process involves: 1. A personal interview, with a lot of listening and note taking from me. 2. Strategy creation, keyword research and content development. 3. Professional editing and proofreading. 4. Delivery, review and feedback by client 5. Revisions if needed and complete satisfaction from a team of two professionals working on each résumé. Managers, Executives and other high earners that pay for premium services also receive extra time interviewing, job search advice and strategies during the interview. The bottom line is, my process is goof proof at making sure my clients are satisfied. All documents can be edited by you anytime. MBA and Fortune 500 caliber service is no accident. 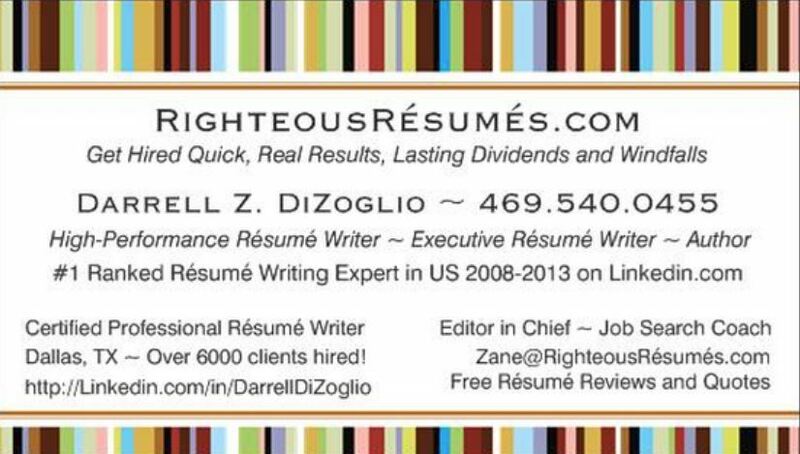 Darrell DiZoglio, Certified Professional Resume Writer in Dallas TX. Help a friend in need succeed by referring them to me for resume writing help.